There is a sense of chaos involved in the act of falling in love, a lack of control, and quite possibly a hint of something tragic, a chance to be hurt. This applies to the slim but haunting novel My Only Wife (Dzanc Books) by Jac Jemc. In marriage there is the possibility of intimacy, a merging of spirit and life, but the reality can be a dense caryatid carved out of lies, mysteries, and selfish acts. My Only Wife is about an unnamed couple, a husband who has fallen and surrendered, and a deceptive, passionate and quirky wife. The way Jemc renders their story is painful in its depiction of beauty and love, vicious in its evocation of what a broken heart feels like—the eternal echo of a call left unanswered. The wife is an enigma, defying expectations—inclusive and dependent one minute, reclusive and absent the next—and the Cohen lines, especially, touch on the idea of a cruel mistress (or master) who would ask a lover to stay in a place where there is only the ghost of what used to be. The wife is a waitress, and though she keeps her thoughts and interpretations private, she has a unique ability to listen, to pull hidden narratives from her customers as if laying her hands on them to rid their souls of demons, and she shares their personal matters with her husband. In the beginning of the novel, this behavior is eccentric at worst, just her way of connecting to the world, of being intimate, of embracing one of her many gifts. Over time, it becomes a weapon, a means of separating the couple. “My wife walked out of theaters when she was bored, offended, tired, felt like moving. And so it goes. The husband worships the wife from afar, this distance she has put between them, allowing himself to be manipulated, grateful for what he has, always the optimist, happy to bask in her beauty, her uniqueness, her gifts. The reader is taken aback and, much like her husband, always searching for a logical reason for her outburst, for an apology, a way to make her happy. A simple mistake doesn’t warrant such vitriol. Relationships are give-and-take, we build our partners up—we don’t break them down. But with a deft hand Jemc weaves a pattern of contented life with that of misery and frustration. One day the couple is in love, holding hands and walking in the rain, and the next day they’re coming to the realization that they don’t know each other at all. It is a powerful potion that is brewed and simmered over time, building toward something, an end we know is coming, has been telegraphed already—but the mystery of how the darkness will descend still awaits us. Another example. Late in the novel, the wife finds a love letter that the husband wrote to her a long time ago. The expected response would be one of nostalgia, of romance and appreciation. But she erases the letter instead. Why? She erases the letter because she can. The impermanence of the letter has offended her—why write it in pencil so that it can be rubbed blurry, so that it can fade over time, why make a gesture that is so fleeting? Love is eternal. And like so many times throughout this tense and beautiful novel, we nod our heads in agreement with her, the romantic in us all seeing her point, while at the same time inhaling with shock at the brutality of the act, her deletion, and the crass way in which she confesses her sin. To print any more of this letter would be unfair to future readers as it is one of the many deathblows that resonate throughout the final pages of this novel. 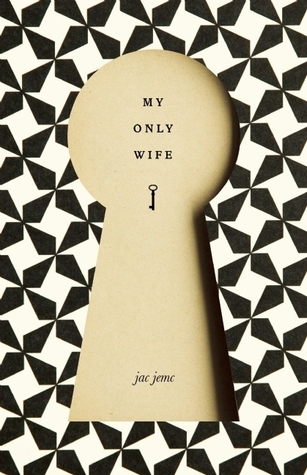 In My Only Wife, Jac Jemc takes the noir and beauty and eternity of what we think is love and creates an entirely new narrative. As much as the husband in this story is the victim, powerless to resist or refuse, so are we. Captivated by the flawed goddess that is his wife, we are lured in by her siren song and dashed across the rocks. Maybe we will learn—or maybe we never had a chance. Great review! I’m so looking forward to reading it!